Dialogue to Clarify Intention: Initial meeting to explain the Feng Shui process, answer any questions and discuss your vision for your life. Clarity about your goals ensures that I can wed your intentions to your space. Everywhere you look and every enhancement you place will anchor the projected future you seek. Site and Landscape Evaluation: To determine the surrounding area that affects your home and personal life. Evaluating the approach to your home from an environmental standpoint will give you a new perspective about what you and your guests are “passing through” in order to arrive at your residence. Front Entrance Evaluation: The front door is the mouth of Chi’ (vital force) to your home. It sends a profound message to the outside world. When residential entrances present a “solid front” and a warm invitation to enter, the communication to all who enter is positive and welcoming. Living Space Evaluation: Assessment of furniture placement, clutter, cleanliness, flow, lighting, corners, shelving, cabinets, electrical equipment and cords, ergonomics, chair quality, columns, beams and architectural anomalies. This assessment gives you information about comfort, safety and functionality from a Feng Shui perspective. Balancing Tour of the Five Elements: Observation of the components in your space and landscape from an organic point of view. How much Metal? How much Wood? How much Water? Is the blend of these elements beneficial and consistent with your intentions for your environment? I will make specific recommendations to bring these universal energies into balance. Applying the Bagua Map to Your Floor Plan: The Bagua Map is a holistic map of structure from the I Ching that identifies 9 specific areas of an environment, their locations, and the impact of each one. 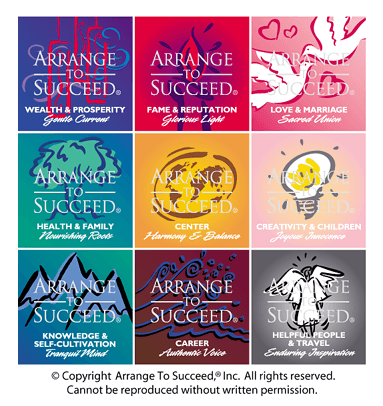 These areas are: Knowledge, Health, Wealth, Fame, Love, Creativity, People, Career and a Strong Core. As you clarify your desired growth in each area and design a plan of action, I help you choose an enhancement for each area. That way, your words are anchored in your space and you receive a visual cue every time you pass by the positioned symbol. Reference Materials & Detailed Report: I provide reference materials and a detailed report to help you on your Feng Shui journey towards purposeful placement in your environment. My suggestions are customized to your unique situation, vision and budget. Check-in Phone Calls: Keeping the communication open between us provides an avenue for a truly successful experience. Sharing your changes and asking new questions as you change will keep your Feng Shui experience alive and thriving. Real Estate & Feng Shui: If you are buying or selling a home, I can help incorporate Feng Shui principles to maximize the success of your endeavor.